Disclaimer - This is a sponsored post. As always, the thoughts and opinions are 100% my own. Thanks for supporting Always A New Day. Raise your hand if you love anything that makes your daily chores easier. Yes, please! 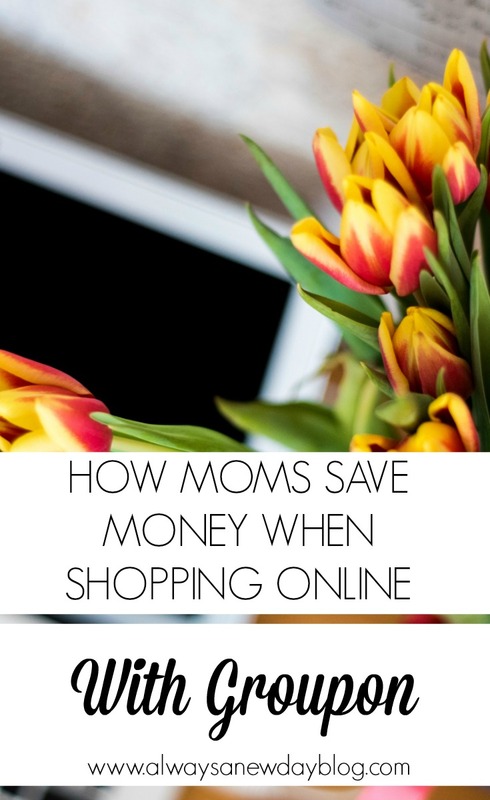 With two kids always on the go, I turn to online shopping to get errands complete. And to be honest - it saves my sanity instead of taking a certain precious and precocious threenager to the stores. Where are my toddler moms? Can you feel me? When you can save money, too - it's such a huge win and makes any mom feel like the queen of the world. I love getting my daily emails from my favorite coupon site and wanted to share how you can also benefit from the amazing world of Groupon. While this cutie may get a little something, this fitness mama is eyeing some treats of her own! And my favorite part of Groupon is there is no membership fee or any other fee attached. FREE to join and easy to use! We are an active family which results in running gear for me and new shoes every so often for my growing boy. I don't plan to spend without thought as I mentioned in my post about giving up unnecessary spending, but when he does outgrow those shoes, I feel good knowing Groupon is going to save us some dough. Do you use Groupon? What are your favorite coupons? You can also learn more about Groupon via Facebook and Twitter.